As discussed in a previous post, the United States has been noticeably silent with regard to recent protests. In early August, after nearly 100 protesters were gunned down by the Ethiopian security forces, the US Embassy in Ethiopia released a paltry statement with the absurd suggestion that protesters should engage in “constructive dialogue” with the government. Less than two weeks later, the State Department issued a travel advisory, but still failed to condemn government’s use of excessive force on the protestors and its role in the political upheaval on the ground. But then, on August 21st, US Assistant Secretary for Democracy, Human Rights, and Labor, Tom Malinowski, released an op-ed, calling the abuses by government officials as “self-defeating tactics.” The strongly worded statement explains that the protests are “a manifestation of Ethiopian citizens’ expectation of more responsive governance and political pluralism” and that protesters are “exercising their right under Ethiopia’s constitution to express their views.” If that isn’t a strong enough endorsement of the protesters, Malinowski then rips apart the myth that the protests are being perpetuated by outside forces—a myth spread far and wide by the Ethiopian government itself. Last week, according to the Ethiopian government, 23 inmates at the high-security prison, Qilinto, died after a fire where anti-government protesters and political prisoners, including Bekele Gerba, Pastor Omot, Ethiopian Muslim leaders, and many others are being held. The identity of the dead prisoners has not been made public, while the fate of the political leaders remains unknown. At a grave time like this, the importance of a statement from the US government, cannot go understated. However, it is not enough. As the single largest country donor to Ethiopia, the US has huge power and influence in the country. Until recently, the Obama administration may have accepted the lack of democracy, muzzling of media and civil society, and widespread violations of human rights as the price to pay for ensuring stability and strong rule in a country that has been a critical ally in a highly unstable region. Recent developments may prove this to be a miscalculation as growing resentment against the regime’s abuses has ignited instability and violence in the country, with many fearing political unrest, as seen in neighbouring South Sudan and Somalia. To date, silent complicity of the United States has signaled that violent repression on the part of the Ethiopian government is permissible. Time and time again, the Oakland Institute has called the US government out for not taking a stronger stance, asking how much blood must be shed before the US is willing to stand up for human rights and true development in Ethiopia. 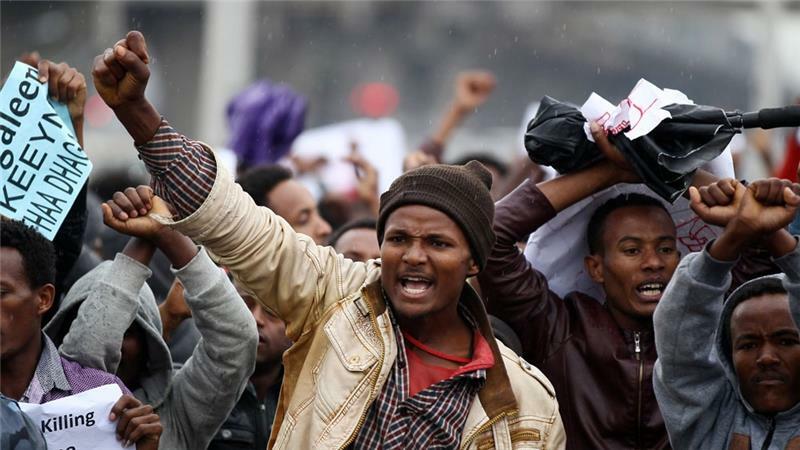 With renewed calls for protests against the Ethiopian regime both within and outside the country gaining momentum, perhaps we are at a tipping point. Perhaps this will be the turning of the tide.